From Notes: Pours a deep straw producing 2 fingers of somewhat lasting, pillowy, white foam head that leaves only a few blotches & streaks of lace. Aroma is sweet, doughy wheat, pilsner malt, a little grass & lemon (hallertau hops? ), yeast & a hint of yeasty fruit esters & thin smoke. Pineapple is present but backstage. Taste is a little bitter, slightly tart, yeasty & smokey up front. Wheat in middle with a hint of clove, hoppy grass & lemon combine with cracker & biscuit of Pilsner malt to produce a clean but snappy pepper, dry finish. The smoke is detectable throughout the sip but the pineapple is very subtle. Aftertaste is bittersweet, clean & shortlived. Mouthfeel is light bodied or if you are really pushing it light-medium bodied, lively with carbonation, crisp, dry & oh so drinkable. 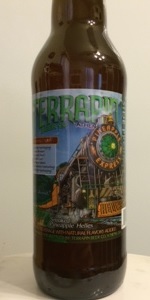 Pineapple Express (Side Project 21) is the winner of Terrapin's first annual Employee Homebrew Challenge. A big burst of carbonation when opened. Fairly clear, light-golden color with an overly huge white head filling the entire glass. Smoke and pineapple heavy in the nose, along with some nutmeg and medicinal notes. More of a rauchbier than a helles in the flavor. Big smoke upfront with a helles taste in the background. The pineapple is subtle, but present, and the entire beer is pretty-well balanced on the whole. Rauchbiers aren't really my thing, but I can appreciate how well-crafted this is and think a lot of people would really enjoy it. Tasted from draft at Firkin on February 27, 2015. I give this beer a lot of credit for being both (a) a beer that maybe shouldn't work, but strangely does, and (b) really going out on a limb, as far as I'm concerned, while somehow strangely keeping its wilder impulses fairly reigned. While ostensibly a Helles Lager, the overall effect and composition of Pineapple Express lends itself more to smoke beer discrimination than anything else. The nose is sugary, with pineapple overtones, but its heart is all campfire and wood; the flavor matches, but moreover extends the sentiment, with a cascading and clarion assertion of its smoked malt base—a brewing decision that keeps the texture and the malt-load light and fluffy, but adds a dark, burnt richness to the body of the beer. Meanwhile: true to its Helles Lager inspiration, the beer is a very blonde golden complexion—echoing the grilled-pineapple notions that suffuse the brew—but it's paired with a somewhat sediment-heavy turbidity, a payload of yeast that helps accentuate the subtle tropical-fruitiness provided by the pineapple addition. Overall, I'd have to say this is a success—though I'm a non-trivially big fan of smoke beers—and a surprising success, at that, given the adventurousness of the concept (not to mention the employee homebrew provenance). It's tasty, yes, but bonus points are due for nailing a beer that was born from what could have been a sketchy premise.